This lesson will walk you through a step-by-step process of understanding a stock option chain. But first...what is an option chain? An option chain is a list of all the stock option contracts available for a given security (stock). Learning how to read an option chain is a vital component to options trading. Many traders lose money because they don't fully understand option chains. There are only 2 types of stock option contracts, Puts and Calls, so an option chain is essentially a list of all the Puts and Calls available for the particular stock you're looking at. Now that wasn't so hard to understand was it? Well the confusing part comes when you actually pull up a stock option chain. All that easy-to-understand information suddenly gets lost in translation and you're left looking at a table full of numbers and symbols that make absolutely no sense at all. You've used the Investor's Business Daily (IBD) to find a list of good stocks to buy (Step 1). You've looked at the stock charts of those stocks and if you like what you see you add it to your stock watch list until you reach a list size of 50-100 stocks (Step 2). You've used a bit of stock trend analysis to review your stock charts on a daily or weekly basis. This process is used to find potential trades (Step 3). After you've found a potential trade, you look over the option chain and pre-select the option you're going to buy or sell. This begins Step 4: The Stock Option Chain. Part of the confusion in understanding option chains is that every option chain looks different. If you go to Yahoo, MSN, CBOE, or your brokerage account and pull up an option quote, you will notice that the layout of each of their option chains is completely different. They all essentially have the same information displayed, but look completely different. As you can see from the picture there are several different expiration months listed horizontally across the top of the option chain (Aug 09, Sep 09, Dec 09, etc.). For our example we are looking at all the call and put options that expire the 3rd week of December 2009. Some traders want to stay in a trade 1 week, some want to stay in a trade 2 months, so your trading plan will dictate which month you look at. I like to give myself plenty of time for the trade to work out so I always try to look at options that expire 2-6 months from the current date. Each stock option chain will list out all the call options and all the put options for the particular stock. Depending on which option chain you are looking at, the call options may be listed above the put options or sometimes the calls and puts are listed side-by-side. The first column lists all of the different strike prices of the stock that you can trade. The strike/exercise price of an option is the "price" at which the stock will be bought or sold when the option is exercised. The second column lists all of the different ticker/trading symbols for each stock option. 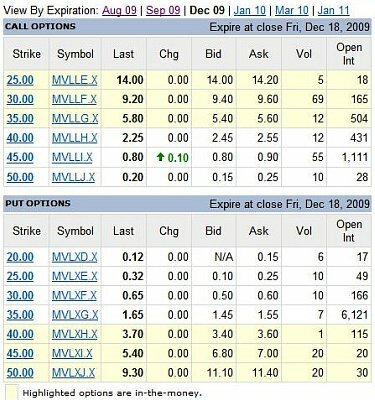 "MVLLE.X" is the ticker symbol for the 09 December 25 call option. The symbol identifies 4 things: which stock this option belongs to, what the strike price is, what month it expires in, and if it is a call or a put option. The third column lists the last price at which an option was traded (was opened or closed). It's the price at which the transaction took place. Be aware that this transaction could have been minutes, days, or weeks ago, and may not reflect the current market price. The fourth column lists the change in the options price. It shows how much the option price has risen or fallen since the previous day's close. The Bid price is the price that a buyer is willing to pay for that particular stock option. It's like buying a home at an auction, you bid (offer) what you are willing to pay for the home. When you are selling an option contract, this is usually the price you will receive for the stock option. The Ask price is the price that a seller is willing to accept for that particular stock option. This is the price the seller is "asking" for. So when you are buying an option contract this is usually the price you will pay for the stock option. BE CAREFUL: remember one stock option contract controls 100 shares of stock. So whatever Bid/Ask price you see has to be multiplied by 100. This will be the actual cost of the contract. List how many stock option contracts were traded throughout the day. This column lists the total number of option contracts still outstanding. These are contracts that have not been exercised, closed, or expired. The higher the open interest, the easier it will be to buy or sell the stock option because it means a great deal of traders are trading this stock option. In one of the previous lessons you performed stock trend analysis to find trades. Let's pretend you found a potential trade. You then look over the option chain and pre-select the option you're going to buy or sell. You're either going to look at the Call option or the Put option portion of the option chain. If your analysis tells you that the stock is going to rise higher, you evaluate the Call option portion of the option chain. And vice versa for Put options. The next step is to figure out how long you plan on staying in the trade. If you want to give the trade 2 months to work out, then you look for options that are going to expire 3 months out. Why 3 months out? It's because the options time value decays rapidly the last 30 days of it's life. This rule is simple. You're going to pick the At-the-Money (ATM) stock option. This rule was also covered in the strike price lesson. If you can't afford the ATM option, then you can look for a closer expiration month or move on and find a trade on a stock where you can afford the stock options. Only buy stock options with an open interest of 100 or higher. This ensures that there are enough people trading the option to make it worth your time. The more people trading the stock option, the easier it will be to buy and sell the option. Here you simply look for the best value. Check out the price of stock options for other expiration months and see if you can find a good deal. Maybe you will find a stock option that expires 2 months later, but only costs a few dollars more. You want to make sure the Bid/Ask spread is small (for ex. $4/4.2). If it's too wide ($4/$5) then it may mean that this stock option is not in much demand. Also keep in mind that you have to multiply the cost by 100. So $4/.2 is a difference of $20 and $4/$5 is a difference of $100. In the next lesson, you'll see how all of this plays out in a real trade.